Hazel's Quilts: Christmas QAL - July pt3 - by GEORGE! You know what? It's not very festive round here yet - so we need to put that right! So here is GEORGE THE SCARECROW in his Santa hat to get us in the mood. Yup - he looks like Lesley's Granddad George, so George it is. I wonder if Granddad George ever wore a Santa hat...? Actually, I wonder if Granddad George ever looking this grumpy! Time for a bit of piecing, I think - and then, a little festive baking? Mmmmm! Hahaha...no, my grandfather never looked so sour! But I shall smile every time I see Scarecrow George...so glad he at least has a face now! He's such a cute sourpuss, especially with that Santa hat! George is back with his flat cap now, Lesley and we're off on a quick trip to the allotment to get him settled in! I hope so - for a moment there it was like that episode of Dr Who where Maureen Lipman steals everyone's face! 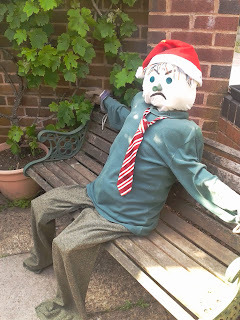 Might have swapped one Dr Who for another - remember the scarey scarecrow one? Think it was called 'the family' set in a boarding school in 1910's. Love George!! I have done an update on my post - I have some errands and guests arriving later, so I will wrap up for today and be back tomorrow. Thank you for a lovely day. Tootle-pip, Sharon - see ya tomorrow! George is a good name, but he's a grumpy one. I'm sure Lesley appreciates the Santa hat since she loves Santa. Yep, I do love Santas! George is a great name for this chap. He suits it, I think, Donna! Grumpy George looks wonderful. I love him. We'll see if the judges at the Hill do too, Sue!